When you’re in Melbourne, you have to visit Cumulus Inc by Andrew McConnell – very simple Mediterranean, with a little touch of Asian, and delicious flavours. It’s a very cool environment, typically Melbourne with washed brick buildings, a simple open kitchen so you can see what the chefs are working on, a noisy, busy bar with a lot of interesting cocktails and beers. Something he is famous for is serving Ortiz anchovies with sourdough bread, home-churned butter and salt – it seems like a ridiculously simple thing to do, but it’s the best anchovies in the world, served in a way that is utterly delicious. He became famous for using compound flavours – like a lot of grains and lentils and throwing that together with a roasted beetroot salad, maybe with a bit of lamb’s lettuce. Such simple ingredients but you get a whole mix of textures and you might bite into a caper so you also get something salty, and vinegary, and wholly unexpected in there. Melbourne’s full of places like this. You have St Ali, Seven Seeds – we’re coffee-obsessed. 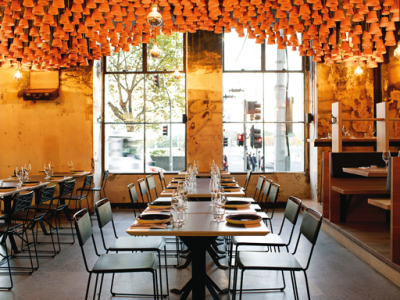 George Calombaris’ Gazi is Greek street food. Old-timers from Greece will tell you it’s not what they remember – there’s a sweet potato dip there with crispy chicken skin on top. You could have souvlaki, served on a bit of soft bread, some Dijon mustard and French fries and brisket, and you think I should be on a street corner eating this, but it’s nice to be sipping a glass of wine with it. Kinda crazy but fantastic! Ortiga, in Brisbane, is one of my favourites – it’s Spanish food with an earthy vibe. You walk into a bar with typical Spanish beers and sherrys and charcuterie hanging there – the kind of thing you expect to be seeing in San Sebastián. Then downstairs you have a cool restaurant with natural wood, an open kitchen with lots of stainless steel. It’s cutting edge – earthy Spanish food with a twist. You can expect things like espuma foam or jelly, aired with quail or morcilla, which is like a Spanish version of black pudding. So these are classics but shot up into the future. Urbane would be another good restaurant since they have a funky bar too. It is a fine dining restaurant but in the back there is more of a street food kind of space where you can go have burgers and funky hot dogs served in a fresh style. I like that juxtaposition of fine dining and street food. I love Perth, they have lots of little cafés and restaurants, and they have become very neighborhood-driven, not at the high end at all, really cheap. West End Deli is an owner-run bakery with great breakfasts. I had the best mushroom terrine with gorgonzola butter on top melting through, so you get that fungus-sy mushroom taste with the blue cheese in it, which is really beautiful. Matt Preston, George and I just kept eating that. Along similar lines there’s Cantina 663 and Gordon Street Garage. In terms of restaurants, there’s Pata Negra which has some very earthy Spanish food with lots of saffron and chorizo. Kurt Sampson, the chef there, is originally from Melbourne. They do a version of churros shaped like doughnuts and filled with jam, served with ice cream that is freshly churned in an ancient machine. They just turn off the machine, scoop it out and lob it into a glass for you! Print Hall, which is located at the centre of Perth, has lots of different restaurants including a fusion South-East Asian place called The Apple Daily Bar & Eating House. Greenhouse is all about the recyclable, ecologically and environmentally friendly. They’ve got a composter upstairs, and you sit in a rustic plywood building made of recycled materials, in a bar of recycled iron. And Perth is a sharp new city, so you’re sitting in this sort of rickety thing, looking at a sharp skyline, eating very simple food like gazpacho and salad with grains. I love Porteno – it’s an Argentinean grill, lots of meat. They have a circular barbeque pit with these skewers of lamb and pork which are constantly basted. They also have little dishes like deep fried Brussels sprouts – who would deep fry Brussels sprouts?! But it’s amazing – crispy and caramelised and sweet. The pork and lamb that comes off the grill is chopped and served to you, and if you’re a VIP, which I always am, they always ask you which cut of meat you would prefer. There’s only four beasts so there’s only a limited amount of each cut. For fine dining in Sydney, I would go to Sixpenny, Aria and Peter Gilmore’s Quay, which is probably the best restaurant in Australia. I’d go to Hugos in Manly – it’s iconic Australian, where you’re looking over the harbour with ferries chugging in, eating pizza. In Hobart, Tasmania, I’d go to the Pigeon Hole, a breakfast joint – I’ve had a great Croque Monsieur, and eggs en cocotte in a little clay dish, with tallegio and white sauce, and some great coffee. There’s also Garagistes and it has incredible food – whole slow roasted shoulder of lamb, just beautiful fresh food. Gary holds forth on the good, the bland, and the spicy…. So many curry dishes from Asian-origin cooks – boring? That is not the case, as we have many great non-curry dishes by many different Asian-origin contestants. We love exploring and celebrating multiculturalism. Most outstanding curry ever had – on the show or otherwise…. I loved Mindy Wood’s, in Season 4, she made a Thai green curry with mussels and crispy rice. Most important factors in cooking up a curry…. Best experience of Indian fusion cuisine…. Chef Manish Mehrotra at Indian Accent in New Delhi. Weirdest thing found in a curry…. My curry experiences outside of spice and sauce have been quite tame. But pig’s throat and blood sausage in a broth in Hong Kong is a different story.